She came calling at my front door and stepped past me into our living room as I greeted her. I was taken aback by her enthusiastic hug and her burst of questions: What are you doing now? Exercising? Cooking for your husband? This is my neighbor and the friendliest woman on our dusty, busy road just outside of downtown Makeni, Sierra Leone. Our little family of three (four, actually, as we were soon to find out) had just moved there as brand new missionaries, ready to learn the language, make some friends, and help translate the Bible into Themne. Within a couple weeks of arriving in our new home, I fell in a ditch nearly breaking my ankle. Embarrassment kept me from fainting on the street, which was busy with our new neighborhood, motorcycle taxis, and concerned and curious spectators of this ridiculous white woman just trying to buy some eggs. My neighbor friend, already described, ran to my aid prepared with a firm foot massage and goat fat to ease my pain. She was at my bedside, and my discomfort was at a peak as I struggled to take in the life our family was now living. This physical discomfort also became spiritual as she prayed in Arabic after another friend prayed for me in Themne. She is Muslim, and my other friend is Christian. There was no hesitation in their interaction, representative of the unusually spiritually tolerant Sierra Leone. Our nearly 100% Muslim neighborhood has two mosques which broadcast the Call to Prayer simultaneously, and everyone we’ve met is thrilled we’re there working with Bible translation. My Muslim friend took it upon herself to be my walking buddy for days after as I walked across the road from her home to mine. I obviously did not yet know how to dodge motorcycles while carrying eggs she sold to me, but thankfully my white skin glowed like reflectors, and I had my friend at my side. 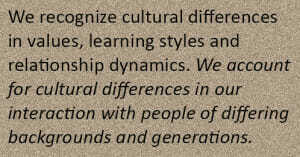 I had taken my first classes emphasizing cultural sensitivity eight years earlier. 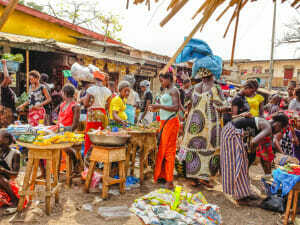 Many classes toward a Master’s degree followed, including spending three months in nearby Ghana simply to learn to live and work in West Africa. A few linguistics schools in the U.S. and Canada are the training ground for missionaries called to Bible translation, with Lutheran Bible Translators and many other organizations. After years of studying and finally going overseas, I immediately recognized why these training schools and experiences emphasized the importance of cultural sensitivity as inseparable from language. Of course, I’m tempted to live and move and speak and breathe exactly like everyone around me. Many new missionaries think that this is cultural sensitivity—and the way of success. Others may destructively believe total conversion of the people to the missionaries’ home culture’s practices, beliefs, behaviors, and even language is the key to true spiritual transformation. I love my neighbor’s courage. She wants to know who I am and what I do and doesn’t shy away from our differences. My neighbors expect me to act, think, speak, and believe differently from they do. It’s the bridge of effort with mutual respect and love that makes all the difference. Another neighbor friend mustered enough courage to ask me her burning question: Do you breastfeed your baby? Our friendship immediately grew deeper. Little brings a smile to people’s faces faster then when my husband and I struggle to speak Themne. They know it would be easier for us to speak with the limited English they likely understand. But, the efforts we make in Themne are directly connected to the efforts they see us making toward deeper relationship and understanding. Backing my baby West African-style and eating the spicy fish sauces bring smiles of approval and acceptance, but these efforts pale in comparison to reaching across our apparent differences, both inside and out, with language. Isn’t this what Christ did with us? What God does with His Word? Jesus didn’t ignore the cultural barriers before him in addressing the Samaritan woman. He acknowledged them, stepped across them, and chose to touch her life in love to give her life. 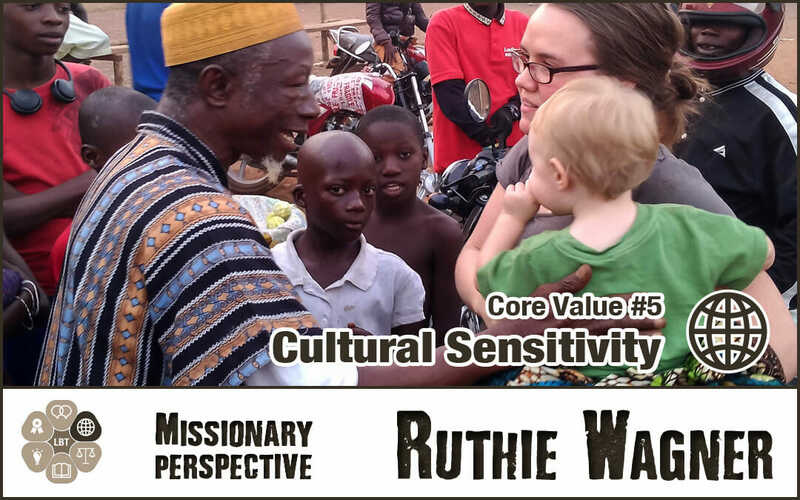 Cultural sensitivity isn’t about following all the cultural rules, it’s about reaching across our differences with love and respect, valuing God’s masterpiece of peoples, distinct in language and culture. In Lutheran Bible Translators, cultural sensitivity is carefully considered within each of our other core values of God’s Word, innovation, professionalism, dialogue, and fiscal responsibility. As we communicate and work with our international partners and within our cross-cultural contexts, we strive to make God’s Word accessible in the language of their hearts, so intertwined with their culture, so that many would come to know and love Jesus, the one who crossed all cultural barriers to bring life. 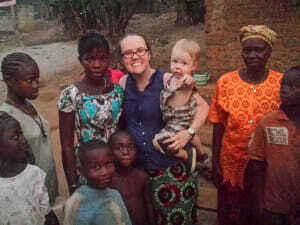 Josh and Ruthie Wagner serve as Scripture engagement and translation advisors with the Themne people of Sierra Leone.